On the 30th of October, my two sons, my daughter, her boyfriend, and I, completed a four day rim to rim backpack trip across the Grand Canyon. 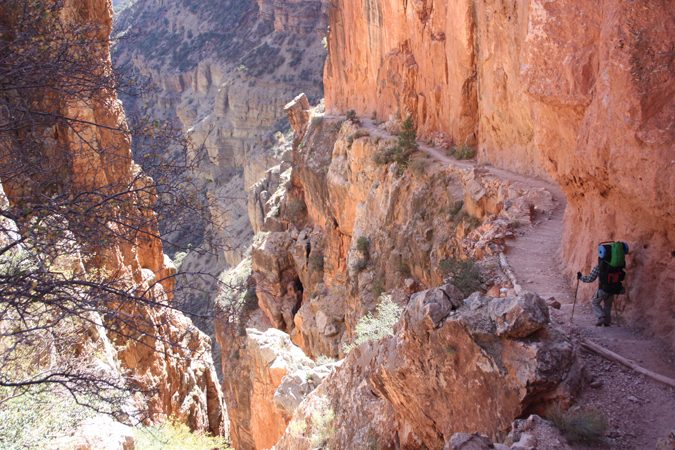 We had walked 24 miles from the North Rim to the South Rim on the North Kaibab and the Bright Angel Trails. Everyone seemed to have done well, with no blisters and only minor muscle soreness at the end. We had paced the hike to use all of the camp areas along the way. That meant that each day's walk was 7 miles or less. So there was plenty of time for rest and recovery. While the temperatures were pretty cool on the rims, they were quite mild down in the Canyon. Night time temperatures were probably in the 40's and it was T shirt weather in the afternoons. With no threat of rain, it was perfect hiking weather! Although the actual trip went very smoothly, getting the logistics organized beforehand was somewhat more complicated. In planning the trip, I knew that we wanted to do the hike from North to South. The longer North Kaibab Trail is not as steep as the two South Rim Trails, so going down that trail would be easier on the legs. The climb out of the Canyon would be less strenuous if it were done in two days rather than one. That could be accomplished by spending a night at Indian Garden, the halfway point on the South Rim's Bright Angel Trail. There were several issues associated with starting the hike on the North Rim. We knew beforehand that the North Rim services would be closing down for the winter on October 15th so we had requested dates prior to that. As it turned out, early October was not available. The permit we were issued had us starting on October 26th. We didn't really need any of the North Rim Services. The real issue was that the road into the park could be closed by the time of our trip. It closes each year after the first significant snowfall. The Park Service had sent us a letter to make sure that we understood that by the time we were due to start, that the area may not be accessible. It stated that if we chose to take the chance and go ahead and pay the permit fees there would be no refunds if the road closed. I talked with one of the shuttle operators who works between the North Rim and the South Rim. He said that it was very rare that the road would be closed in October. He was planning to run his vehicles until the 31st. So we went ahead and took the chance and paid the permit fees. Our last detail to take care of was to find a relative/friend who would be willing to drive us around to the North Kaibab Trailhead, and then return our vehicle to the South Rim. We did not want to leave a truck on the North Rim. It would have cost our group $425 to have used the commercial shuttles. One of my brother-in-laws volunteered to do the job for the cost of his expenses. So once that deal was made, we were good to go. Nighttime temperatures were in the 20's on the North Rim, the week or so before our trip. Camping up there the night before starting our hike did not seem too appealing. We were able to book rooms at the Cliff Dwellers Lodge near Marble Canyon for that night which worked out well. They had a restaurant so we didn't have to fix any meals prior to starting the hike. So on the morning of the hike, it was just get up and go! Day 1: Hiked approximately 7 miles from the North Kaibab Trailhead on the North Rim down to Cottonwood Campground. Day 2: Hiked approximately 7 miles along the North Kaibab Trail from Cottonwood Campground to Bright Angel Campground with a side trip to Ribbon Falls. Day 3: Hiked approximately 5 miles from Bright Angel Campground up to Indian Garden Campground on the Bright Angel Trail. Day 4: Hiked approximately 5 miles from Indian Garden Campground up to the South Rim and the Bright Angel Trailhead.